Wayne Davis was a linebacker for the Alabama Crimson Tide. He posted a career high 125 tackles his Junior year, and 85 in his Senior year. A 9th round pick of the St. Louis Cardinals in 1987, the season was sort of a mess because of the Players’ Strike. Davis saw playing time in all 12 nonstrike games that year, and also in all 16 games in 1988. He’d sign as a Plan B free agent with the Los Angeles Rams in 1989, and then later with the 49ers, who let him go on the final cutdown. Wayne played for the Edmonton Eskimos in 1990, before giving the WLAF a shot. Davis impressed the league scouts enough, that Orlando saw fit to make him the first overall pick of linebackers in the 1991 positional draft. Head Coach Don Matthews liked his overall speed and athleticism. He’d have a solid year, posting 33 tackles, and 2 fumble recoveries. Wayne also played on special teams, recording 8 tackles on kickoff coverage. 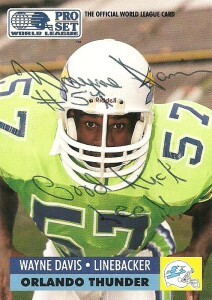 His highlight of the year was a 9 tackle effort in Orlando’s 35-34 victory over the San Antonio Riders on opening day. A man of God, Davis styled himself as being a new found ‘Minister of Defense’ ala Reggie White, bringing the Good Word to the masses, and had been quoted as stating, “God first. 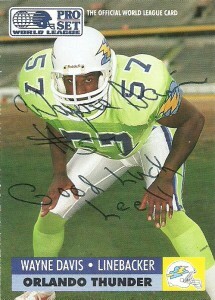 Football second.” After starting off the 1991 season hot, the Thunder had a meltdown and finished 5-5. Matthews quit, and new coach Galen Hall decided to overhaul the franchise. With a plethora of new linebacker blood in camp, Hall had to make some difficult cuts- Davis among them. Wayne however, felt a calling to God greater than football, and was ordained in 1992. Reverend Davis later returned to school and earned to Masters in Education and in Pastoral Ministry and lives in Gordo, Alabama today where he preaches to his flock and congregation.